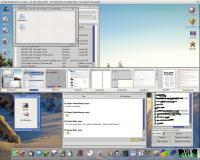 This program was designed to replicate the Windows Alt+Tab shortcut. make your Amiga switch to that screen! This app uses OS4.1 functionality for super fast creation of thumbnails. I made this small utility from the source code of three other small utilitys. Screen A appear and the AltTabSwitcher GUI would appear on that screen. AltTabSwitcher will now always appear on the CURRENT screen. when the gui first opens (requested). need to quit by sending a Control+C through Ranger anymore! - TAB key events are now "eaten" by Alt_Tab_Switcher when the "cycle screens"
increase visibility on other systems. Some screens that have a different depth cannot be scaled for some reason. thumbnails if they're too wide for the current display. be a little beyond me though. screens without using the alt tab switcher program (i.e. using amiga+m). No big deal, it still works fine.